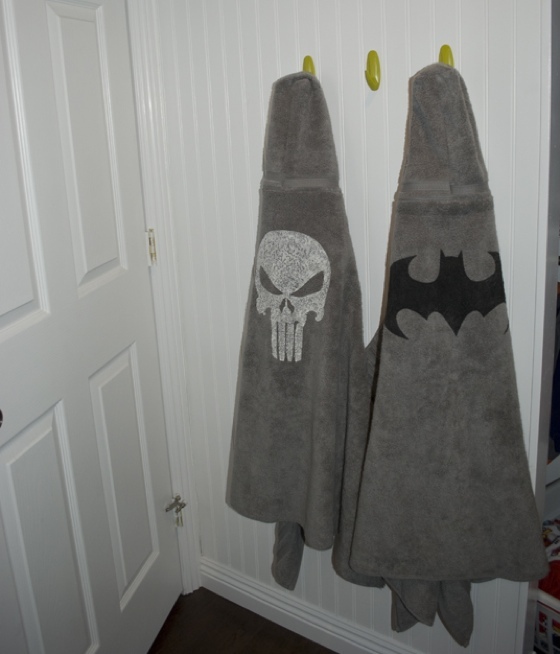 These hooded superhero bath towels would make the perfect craft for getting kids excited to actually go have bath. If you’ve got a child who just hates it when it’s time to go get clean, you can now entice (bribe) them to get in by having a super cool hooded towel waiting for them when they get out! This DIY tutorial looks pretty simple to do, and is a must do craft for anyone who’s got children that love superheroes! I love big hooded bath towels. I have tried some other patterns, but they were so complicated and took forever. A few months ago I was staying as my sis Jenni’s house and she had a great hooded towel that she received as a gift. The hood fit a toddlers head without covering the eyes and was simple. So of course, I started investigating every seam and figured… I can do that. So here it is.